Fayette County is a county in the U.S. state of West Virginia. As of the 2010 census, the population was 46,039. Its county seat is Fayetteville. It is part of the Beckley, WV Metropolitan Statistical Area in Southern West Virginia. Fayette County—originally Fayette County, Virginia—was created by the Virginia General Assembly in February 1831, from parts of Greenbrier, Kanawha, Nicholas, and Logan counties. It was named in honor of the Marquis de la Fayette, who had played a key role assisting the Continental Army during the American Revolutionary War. The second Virginia county so named, it was among the 50 counties which Virginia lost when West Virginia was admitted to the Union as the 35th state in 1863, during the American Civil War. The earlier Fayette County, Virginia existed from 1780 to 1792, and was lost when Kentucky was admitted to the Union. Accordingly, in the government records of Virginia, there will be listings for Fayette County from 1780–1792 and Fayette County from 1831–1863. A substantial portion was subdivided from Fayette County to form Raleigh County in 1850. In 1871, an Act of the West Virginia Legislature severed a small portion to form part of Summers County. Fayette County was home to a disastrous mine explosion at Red Ash in March 1900, in which 46 miners were killed. According to the U.S. Census Bureau, the county has a total area of 668 square miles (1,730 km2), of which 662 square miles (1,710 km2) is land and 6.8 square miles (18 km2) (1.0%) is water. Plum Orchard Lake, a reservoir southwest of Oak Hill, is the second largest lake in West Virginia. As of the census of 2000, there were 47,579 people, 18,945 households, and 13,128 families residing in the county. The population density was 72 people per square mile (28/km²). There were 21,616 housing units at an average density of 33 per square mile (13/km²). The racial makeup of the county was 92.74% White, 5.57% Black or African American, 0.27% Native American, 0.30% Asian, 0.04% Pacific Islander, 0.15% from other races, and 0.93% from two or more races. 0.68% of the population were Hispanic or Latino of any race. There were 18,945 households out of which 29.00% had children under the age of 18 living with them, 52.10% were married couples living together, 13.20% had a female householder with no husband present, and 30.70% were non-families. 26.90% of all households were made up of individuals and 13.40% had someone living alone who was 65 years of age or older. The average household size was 2.41 and the average family size was 2.89. In the county, the population was spread out with 21.70% under the age of 18, 9.60% from 18 to 24, 27.10% from 25 to 44, 25.10% from 45 to 64, and 16.40% who were 65 years of age or older. The median age was 40 years. For every 100 females there were 98.20 males. For every 100 females age 18 and over, there were 94.70 males. The median income for a household in the county was $24,788, and the median income for a family was $30,243. Males had a median income of $28,554 versus $18,317 for females. The per capita income for the county was $13,809. About 18.20% of families and 21.70% of the population were below the poverty line, including 31.90% of those under age 18 and 13.70% of those age 65 or over. As of the 2010 United States Census, there were 46,039 people, 18,813 households, and 12,459 families residing in the county. The population density was 69.6 inhabitants per square mile (26.9/km2). There were 21,618 housing units at an average density of 32.7 per square mile (12.6/km2). The racial makeup of the county was 93.5% white, 4.6% black or African American, 0.2% Asian, 0.2% American Indian, 0.2% from other races, and 1.3% from two or more races. Those of Hispanic or Latino origin made up 0.9% of the population. In terms of ancestry, 16.9% were German, 15.5% were Irish, 10.8% were English, and 9.5% were American. Of the 18,813 households, 28.6% had children under the age of 18 living with them, 48.7% were married couples living together, 12.5% had a female householder with no husband present, 33.8% were non-families, and 29.1% of all households were made up of individuals. The average household size was 2.35 and the average family size was 2.87. The median age was 43.0 years. The median income for a household in the county was $31,912 and the median income for a family was $42,077. Males had a median income of $39,301 versus $24,874 for females. The per capita income for the county was $17,082. About 16.4% of families and 21.3% of the population were below the poverty line, including 30.9% of those under age 18 and 12.5% of those age 65 or over. Fayette County’s political history is typical of West Virginia as a whole. The county leaned Democratic during the Third Party System before the power of industrial and mining political systems turned it strongly towards the Republican Party between 1880 and 1932. Unionization of its predominant coal mining workforce during the New Deal made the county powerfully Democratic between 1932 and 2008: no Republican in this period except Richard Nixon against the strongly leftist George McGovern won forty percent of the county’s vote, and Lyndon Johnson in 1964 exceeded eighty percent against the conservative Barry Goldwater. However, the decline of mining unions and the out-migration of historical black mining families, has produced a rapid swing to the Republican Party – so that over the past three presidential elections swings to the Republican Party have averaged thirty percentage points and Democratic vote percentages plummeted to levels historically more typical of Unionist, traditionally Republican counties like Morgan or Upshur. The county has a tradition of coal mining, which still serves as a primary source of employment in the area. A Georgia Pacific lumber mill has its home to the west of Mt. Hope, adjacent to U.S. Route 19. There exists a large metal alloy plant in Alloy. 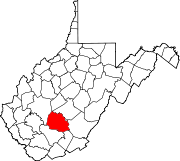 The Mount Olive Correctional Complex, West Virginia's only maximum security state prison, is also located in Fayette County. ^ a b "State & County QuickFacts". United States Census Bureau. Archived from the original on July 10, 2011. Retrieved January 10, 2014. ^ Reporter, C.V. MooreRegister-Herald. "Fayette-Raleigh MPO expands to include entirety of both counties". Beckley Register-Herald. Retrieved 2018-03-27. ^ "e-WV | Red Ash, Rush Run Explosions". www.wvencyclopedia.org. Retrieved 2018-03-27. ^ "2010 Census Gazetteer Files". United States Census Bureau. August 22, 2012. Retrieved July 24, 2015. ^ The leading "other" candidate, Progressive Theodore Roosevelt, received 3,140 votes, while Socialist candidate Eugene Debs received 1,428 votes. This page was last edited on 10 January 2019, at 14:45 (UTC).